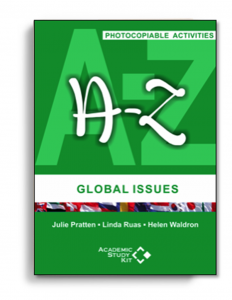 ‘A-Z of Global Issues’ is a resource book containing 26 interesting and engaging activities, discussions and role plays, designed to bring real issues into the classroom. It comes with user-friendly teaching notes, which outline the language focus, level, type of activities, timing and suggested lesson plan. The activities are suitable for business and general ELT students, ESOL, university students and pre-experience learners.